Eye Fillet Steak: lean and tender pasture-fed yearling beef cooked to your liking and topped with your choice of mushroom gravy or creamy peppercorn sauce. 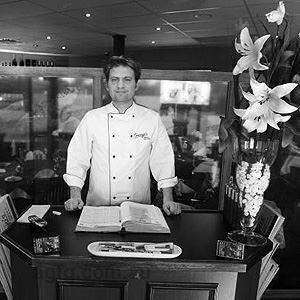 Offering relaxed dining with a touch of class, Georgio's Seafood & Steak House is understandably one of Beaconsfield's most popular restaurants. Upon entering from Old Princes Highway, this suavely decorated restaurant exudes a welcoming warmth from earthy toned walls adorned with leadlight features and crisp white linen clothed tables. Take a seat at dark timber settings and peruse a menu designed for all palates, perhaps opting for an entrée of grilled Moreton Bay bugs, with polenta and a creamy saffron sauce; before a hero main of Georgio's eye fillet, topped with prawns and scallops, served with garlic mash and mixed greens. Pasta lovers can twirl a fork around dishes like braised beef ragu with fresh pappardelle, in a rich tomato and basil sauce, finished with pecorino cheese. Open Sunday and Monday for special functions, minimum 50-99 guests. Variety of menus available, call us now. Free entertainment every second Tuesday with great music. Out group had a great time and the food was not only presented beautifully they tasted amazing. Great place will return again and again. New owner is wonderful. Warm friendly and very accommodating. Nice to see a positive change with a beautiful menu and relaxed atmosphere. My steak was so tender with fresh seafood. The waitress was very friendly and helpful. Finished dinner with a nice desert and port, can't wait to come back. Thanks for the lovely evening! My husband and I have been going to Georgio's ever since it opened. Can't speak highly enough of this restaurant. it is always a truly amazing experience. The food and service is always sensational and the host is most welcoming. I could not fault it in any way. It deserves to be rated as highly as it is. Thanks for the great evening guys! My 3rd time there and once again very impressed. The lamb shanks were magnificant!The atmosphere was very relaxing, exactly what I needed after a long day of work! Ben. Great quality food, complimentary bread and dips, generous serves and top notch service! I have dined her many times. The overall quality of food, service and decor is exceptional. We have never been dissapointed at Georgios and our assessment overall is a very pleasant experience in a very relaxed environment with food and service exceptional. Highly Recommend It! I attended on 11/11/11, a Friday night in a group of four. It was very busy that night so it must be popular. Con (the Owner ) treated our group like Royalty, as did the waitresses. My group had already studied the menu on the Internet Website though there is always an additional Specials menu each week. The Menu is divine if you read it. I could have ordered everything! The desserts were excellent too. It was our first time at the Restaurant. The prices were all reasonable for Melbourne. We all enjoyed the food and wine. I was the only one to order an Entrée. There is a very reasonable priced combination offer for entrée of any six of Oysters, Scallops Styles. I ordered 6 Oysters Kilpatrick and 6 Scallops mornay. They were delicious and filling. All of us enjoyed our main meals. I ate Lobster Thermidore, while the others ate Seafood Platter with Morton Bay Bugs each. The waitresses were always buzzing around close by if we needed attention but not pushy. We all had a great time and loved the food we ate. The Air Conditioning was comfortable. No complaints at all. We'll be back again! Thanks to Con & Staff.